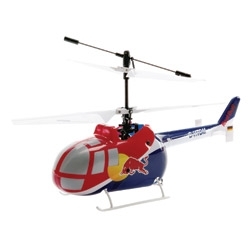 The Blade® Red Bull CBcx will fly circles around other 3-channel RC helicopters like it. State-of-the-art 2.4GHz control with advanced Blade engineering and electronics make it all possible. And it’s easy to fly—you’ll be hovering like a pro on your very first flight, even if you’ve never flown before. The Red Bull BO-105 CB is a highly-modified, 840-horsepower thrill machine capable of performing death-defying aerial stunts like back flips, rolls, loops and the mind-blowing “Chuckcilvak” tumbling maneuver. In fact, it’s the only civilian helicopter of its kind approved to perform these stunts, so if you hear it’s coming to an air show near you, don’t miss it!